Happy Humpday lovelies - how's about a little giveaway to break up the week? For the past few days I have been using and loving the new Bee Strong shampoo and conditioner from Herbal Essences, and three of you will soon be enjoying it too. Honey is such a nourishing ingredient and here it's teamed with apricot extracts to protect and strengthen your hair. I noticed a difference to my dry, bleached ends after just one use - it felt noticeably silkier to the touch. For such an affordable range - prices start at just €2.65 for 200ml of shampoo and conditioner - the products are also genuinely lovely to use. They smell divine, lather up well and rinse out fully to leave my hair feeling glossy and smooth. I'll definitely be keeping an eye out for the intensive conditioning mask in the range. If you're resident in Ireland and fancy winning one of the three sets I have to give away, just pop your details into the box below. What's your favourite range of hair care? Remember when Herbal Essences came in those clear bottles that looked like there were plants and herbs inside. Why did they do away with them? I love that you're a girl after my own heart. While the luxurious stuff is lovely and is a great treat, you just can't beat a bargain with a big schtick. Honey is one of my fave things in the whole wide world, so I'll probably want to eat this!!!! 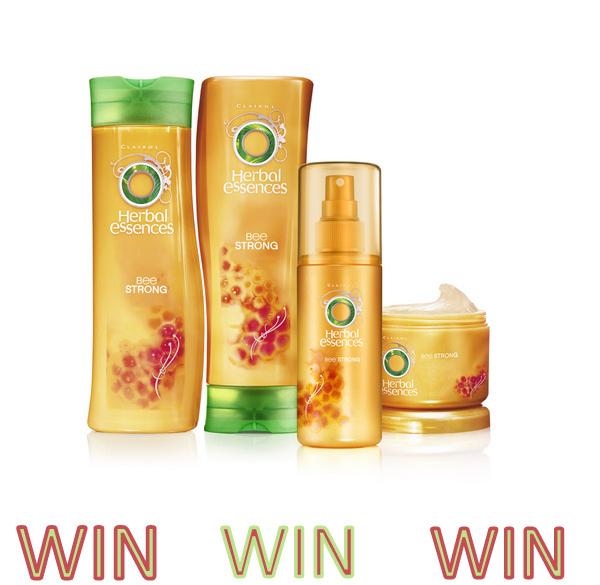 I love Herbal Essences, I bought the Tousle Me Softly range a few weeks ago, & the rest of my family used it up! I like anything on the site to do with eyeshadow because i really am stuck in a rut and never know what's the best value out there! Too bad I can't enter, what a great giveaway! i wish switzerland carried herbal essence, i used it a lot in the states! I love your reviews and your page is very easy to navigate. I love that you have started smiling in your pics!!! i love your reviews & giveaways! I really liked your review of the Chanel Healthy Finish powder. I don't own any Chanel because it's very expensive. But seeing the before and after photo of you really makes me want to get this product! My hair could do with some strengthening! It's always a treat to see Fluff and Fripperies post arrive in my inbox each day. :) I love your mix of high-end and purse-friendly beauty reviews and pictures and enthusiasm for beauty products generally. I've bought countless products upon reading your reviews including YSL Fond de Teint Foundation and make-up brushes. As for shampoo my go-to is L'Oréal Elvive Nutri-Gloss for soft, shiny hair and when feeling a bit more extravagant (pay day:) will treat myself to Kérastaste. Have found the L'Oréal Extraordinary old to be a great, cheaper substitute to Kérastaste oil. I saw this giveaway yesterday and thought I'd give it a miss but then I noticed the split ends and lack of funding for a trip to the hair dresser. I love seeing your reviews on products I havent tried yet... helps me find some new make up favourites! I love all your make up reviews and tips. Always so useful and interesting. I love your product reviews- they are refreshingly honest! I come to your website for reviews and ofcourse, for the giveaways.